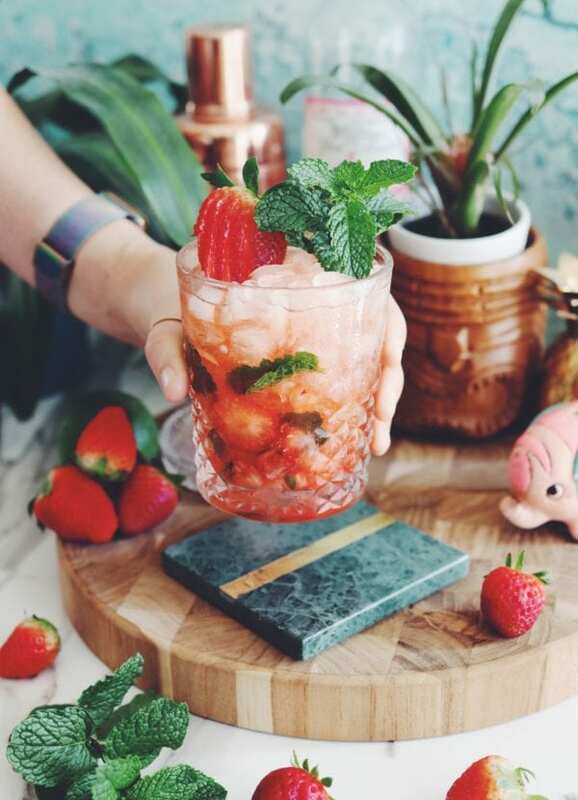 The recipe for this refreshing strawberry mezcal mojito recipe will create your new favorite cocktail! And if you’d like to make a traditional mojito with strawberries, the recipe is pretty much the same — just use white rum instead of mezcal! 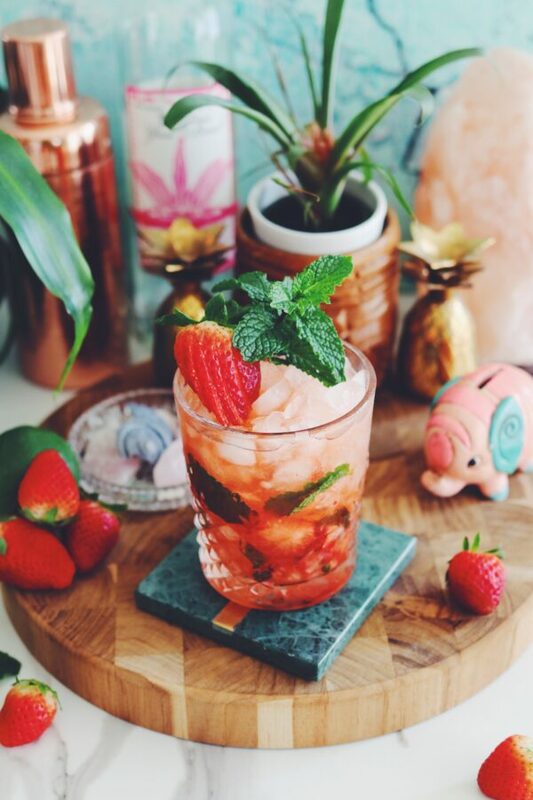 With strawberry season in full swing, you should definitely be using them in this strawberry mezcal mojito! 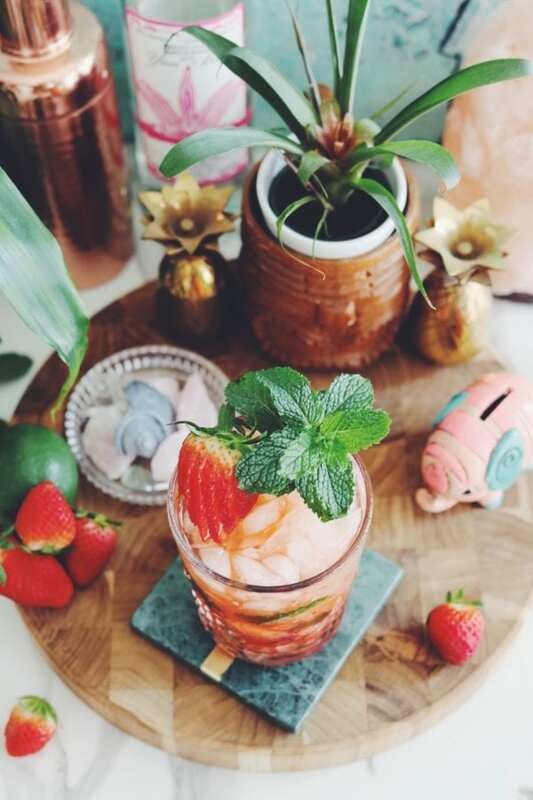 Packed full of fresh mint, sweet strawberries, tart lime juice and smokey mezcal, this cocktail is truly delicious! Unlike traditional mojitos, we will skip the rum and use a smokey mezcal instead. Similar to tequila, mezcal is made from the agave plant. However, it’s cooked underground, in lava-rock-lined pits, which creates the iconic smokey flavor. Some people say that Mezcal is to Tequila as Scotch is to Whiskey. But if you’re still on the fence about Mezcal or you can’t find it in your area, you could definitely still use some clear rum for this recipe! Making a strawberry mojito with mezcal is super easy! To begin, muddle fresh strawberries with lime juice, fresh mint and agave. Just be sure not to over-muddle as it will leave you with a bitter taste. Next, add mezcal and ice and shake vigorously. Add the contents of the shaker into a collins. Lastly, top it off with some fresh ice, a little bit of seltzer and some more mint and strawberries for garnish. There are some notes that I should mention as well. If you don’t like a bunch of mint in your drink, just be sure to strain the cocktail before pouring it into the cup full of ice. It will still be just as minty and delicious! And if you’d like to make this recipe in its traditional form — with rum — then the instructions are pretty much the same. Just follow the recipe above but add rum instead of mezcal. Packed with fresh mint, sweet strawberries, tart lime juice and smokey mezcal, this refreshing cocktail will not dissappoint! Muddle mint, strawberry, lime juice, and agave in a cocktail shaker. Then add mezcal and ice and shake until chilled. Pour contents into collins glass. Top with fresh ice and finish with a splash of seltzer. Garnish with a sprig of mint and a sliced fresh strawberry. If you like this mezcal mojito recipe, you might also like one of these tasty dishes to pair it with! 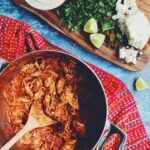 Spicy Shredded Chicken Tinga – Chicken Tinga is an authentic spicy, zesty Mexican shredded chicken recipe that is super easy to make! We make this about once a week in our house and use it to top tacos, tostados, salads and even quesadillas! Get this quick and easy recipe at the bottom of this post! Tequila and Lime Fish Tacos – These ultra-delicious, tropically-inspired coconut tequila lime fish tacos will make any day feel like summer! Served with a cream, spicy avocado salsa, and a pickled cabbage slaw, I guarantee that you’ll love them! 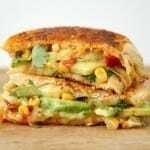 Manchego and Roasted Corn Grilled Cheese – For this grilled cheese, I combine grilled corn on the cob, manchego cheese, and pickled jalapenos. I grill it between two hearty slices of Texas toast that are smeared in smokey chile butter. And for the zinger (literally), fresh lime juice is squeezed on top for the perfect little splash of citrus. Or check out even more of our cocktails right here! Oh, and I’m pretty sure that you’ll love my new cook book, too!